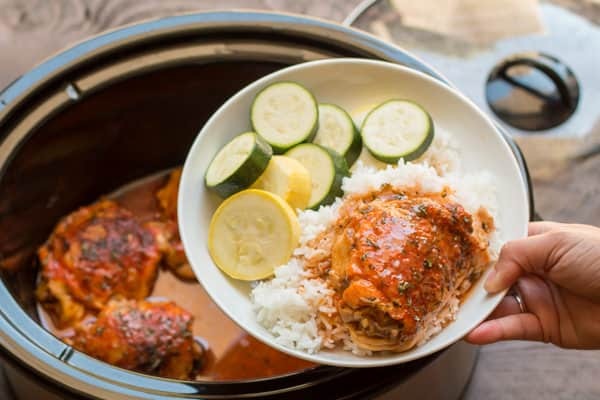 Slow Cooker Hot Chicken is spicy ranch seasoned chicken thighs. Make this a hearty meal with rice and veggies. 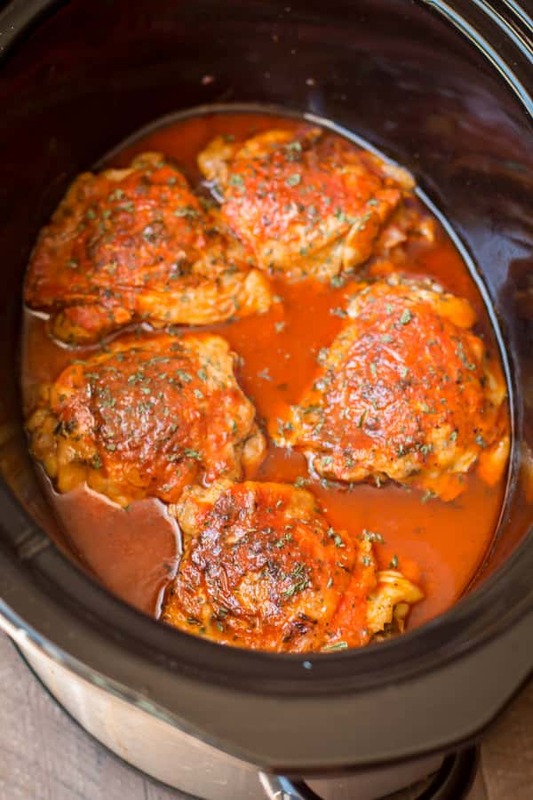 Just when your thinking I wouldn’t dare add another buffalo recipe to the site, here I do it today. Yes, but this one is not an appetizer, it’s dinner! 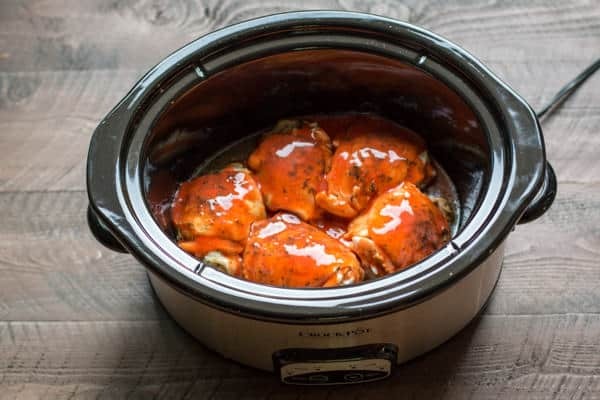 Forget about little chicken wings and serve this Slow Cooker Hot Chicken for dinner. I start by seasoning chicken with ranch flavors. I use spices from my spice cabinet, but you can use a half packet of dry ranch dressing mix instead. I pour over Frank’s Original Hot Sauce. Most buffalo recipes call for butter to mellow out the spice, that is not needed in this recipe. 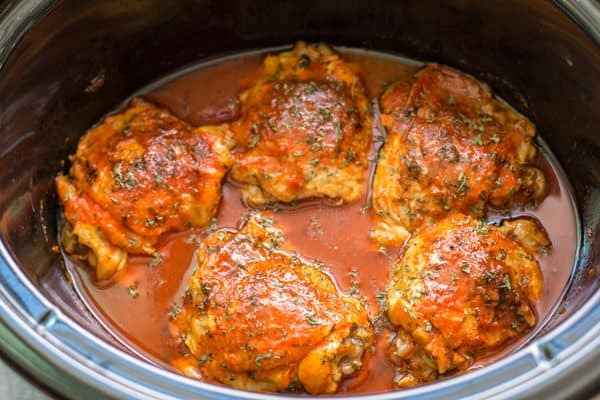 The chicken thighs will cook down and their juices will mellow out the hot sauce a bit. Here is the chicken after being cooked for 4 hours on high. Make this a meal with steamed rice and veggies! If you LOVE buffalo sauce you must try this recipe, you won’t be disappointed. I will be back on Monday with a cheesy recipe! Have a great weekend! In a small bowl combine the parsley, onion powder, garlic salt, and pepper. Sprinkle both sides of the chicken with the mixture. Heat a large skillet over medium-high heat. When the pan is hot, add the oil. Brown the chicken on both sides, you may have to do this in 2 batches if your pan is smaller. Pour over the Frank's Red Hot Sauce trying to cover the chicken entirely. Degrease the sauce before serving. I do this by laying paper towels over the grease, then quickly lifting the paper towel. 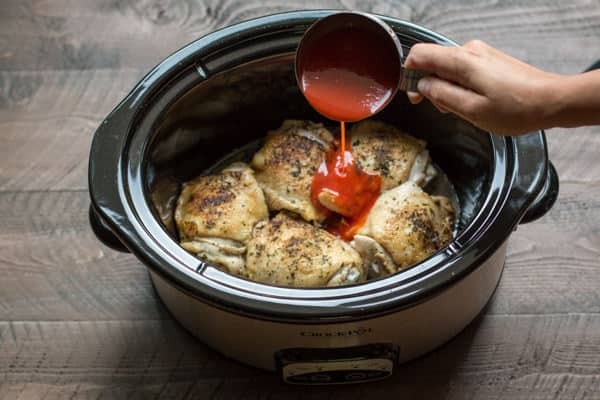 The grease will be on the paper towel, and the sauce still in the slow cooker. You may have to do this a few times with new paper towels. If you don't have the seasonings for this recipe, a half packet of dry ranch mix will do! 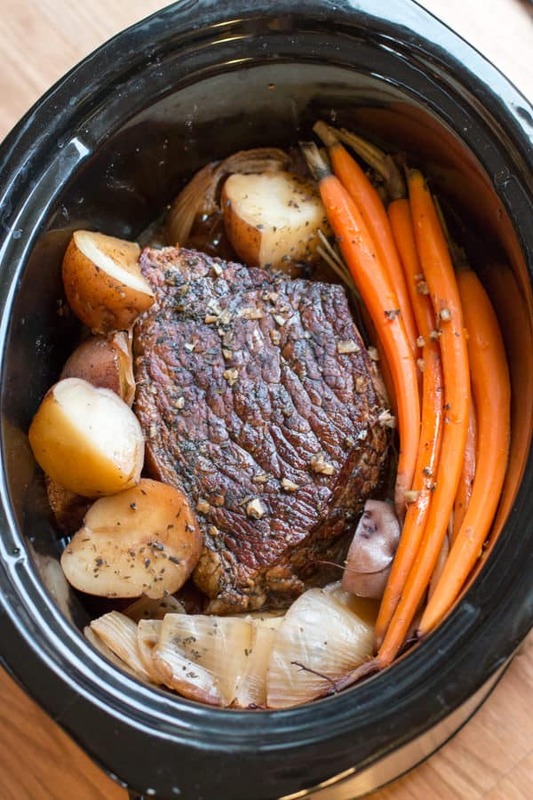 I used my 6-quart oval Crock-Pot for this recipe. Though a 4-quart or larger can be used.